Although Minamoto no Yoshitsune had performed meritorious services in the destruction of the Heike clan, he fell out with his brother, Minamoto no Yoritomo. Yoshitsune found himself with no choice other than to escape with his trusted followers, including Benkei, to Hiraizumi in the Ōshū region and turn to Fujiwara no Hidehira, who was a supporter of Yoshitsune. He and his followers are disguised as mountain priests and reach the barrier at Ataka in Kaga, one of the barriers newly established by Yoritomo, who has heard rumors about the group of pseudo-mountain priests and is trying to capture them. At the Ataka Barrier, they meet the barrier master, Togashi. Benkei, who wants to pass the barrier at all costs, lies to the barrier officer that they are a group of mountain ascetic priests collecting donations for the reconstruction of Todaiji Temple. 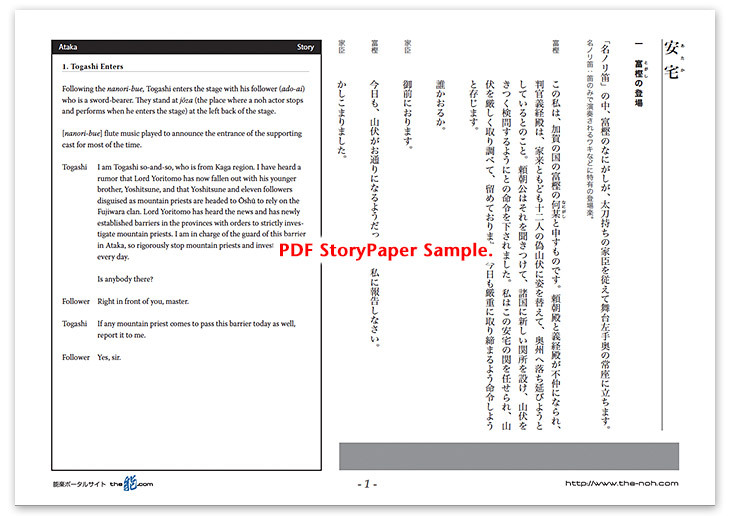 Togashi, the barrier master, is suspicious of them and compels Benkei to read the kanjinchō – a letter of intent for constructing or repairing temples – which proves that they actually are fund-raising monks for Todaiji Temple. Benkei then perfectly reads a scroll as if he is reading a real kanjinchō. Overwhelmed by his vigor, Togashi initially allows them to pass through the barrier. However, he notices Yoshitsune, who is disguised as a porter. 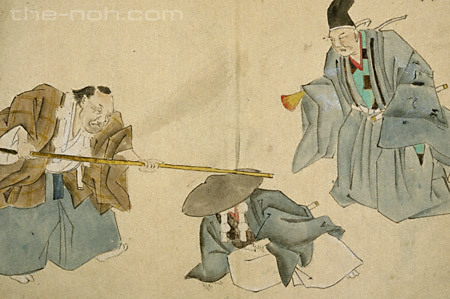 Thinking quickly, Benkei suddenly reproaches Yoshitsune for bringing suspicion upon the entourage and beats Yoshitsune with his stout staff. Overwhelmed by Benkei's determination, Togashi lets them pass. To apologize for his disrespectful behavior at the barrier, after the group has finally passed through the barrier, Togashi later catches up with the group of Yoshitsune and Benkei. Togashi then starts to drink with them. Since Benkei suspects that Togashi might be trying to entrap them, he exercises vigilance while performing the Ennen-no-mai(a dance performed at temples for peace and longevity). Then, the group led by Yoshitsune and Benkei takes leave of the people at the barrier and immediately leaves to escape to Mutsu Province. Ataka is a masterpiece of genzai noh, in which the story evolves as time actually flows. A group of twelve people, including the master Yoshitsune and his followers, is disguised as mountain priests to escape from the capital, and Benkei leads the group. Kokata (a juvenile noh actor) plays the master Yoshitsune. The highlight of this drama is the encounter of Benkei and Togashi at the barrier in Ataka. The story evolves breathlessly from the scene where Benkei reads aloud the kanjinchō, to the scene where he beats his master, and to a standoff between the group of mountain priests and Togashi and his follower. kanjinchō is recognized as one of the three greatest recitals (san-yomimono) and the technique of reciting this utai is secretly passed from generation to generation. The complex combination of the recital and hand drums, in which the vocal and instrument sound as it they are competing with each other, create a climax of the music of this drama. After safely going through the barrier at Ataka, there is a scene in which the audience calmly listens to Yoshitsune's tragic story. However, the peace is broken by the visit of Togashi. In the end, Benkei manages to get his group over the difficulty with his intelligence and dance. The story keeps the audience attentive until the end. This allows the audience to enjoy not only the story but also the musical aspects of noh and the fascinating aspects of noh dance. The whole story is the origin of a famous Kabuki play “Kanjinchō".